When I was a kid, I used to ask my parents what clouds were and they always told me that they were nothing. They said you couldn’t hold a cloud in your hand and you could walk right through them. It just never made sense to me that something that there was so much of in the sky could be nothing at all. It had to be SOMETHING. Over the years as I got older, I would look at clouds and try to find the objects in the world that they resembled. 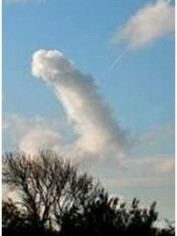 Everyone does this…some clouds look like Jesus, some look like phalluses, etc. So I eventually thought that clouds could be many things and that my parents were dead wrong. In planes, clouds scared me because they blocked out the view and I always wondered when a pilot is training how he/she gets over flying through a cloud. It must be scary not being able to see in front of you. As a passenger, I love being about the clouds and seeing them create a floor in the sky. They look so solid as if you could walk on them. As beautiful as clouds can be, they have been a source of anxiety for me several times in my life. When I was in the Canary Islands a few years ago, we were driving down from the peak of La Gomera Garajonay Park and were so high up that the clouds descended on us in the car. The roads were incredibly windy and we couldn’t see all that well and I panicked. I also don’t like clouds when they turn dark and get close to the ground before a storm. They make me think they are turning into tornados when they do this…and I am terrified of tornados. I like my cloud white and fluffy. Unlike fog, which is dark, thick and ominous. Clouds somehow carry hope, happiness and light. There are always clouds around the rainbows children draw. Clouds make a bright blue sky seem bluer. I prefer my bluest skies with a cloud or too. They remind you that imperfection is beautiful too. So someday when my son asks me what a cloud is, I will not answer “nothing”. I will teach him the complexity of clouds and how something that seems quite trivial can have so much meaning.